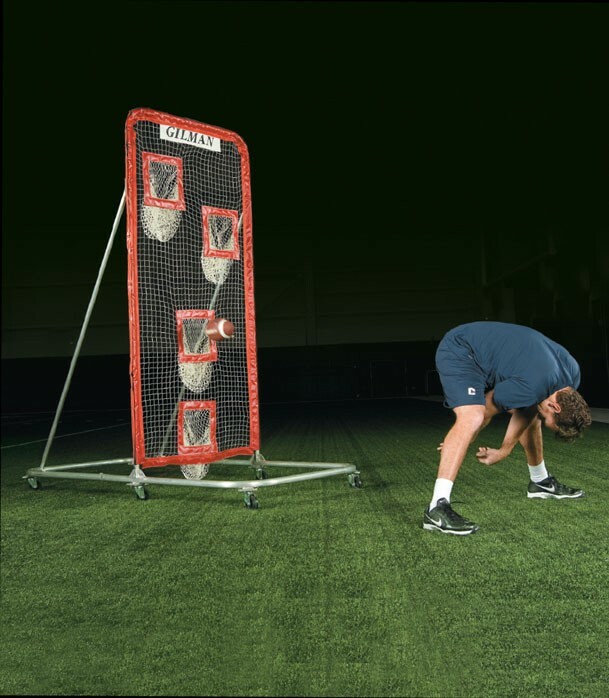 The SNAP NET gives your center an opportunity to work on their own to perfect long and short snaps. The net gives the center instant feedback as to the accuracy of his snaps. If the ball drops into the pocket, it's an accurate snap. The center can snap the ball, get his head up and work on protection-and not watch the flight of the ball. The center can get a lot of reps without compromising technique. The net is on wheels. Roll it back 14 yards to simulate long snaps for punts. Roll it back 8 yards to simulate short snaps for PAT's. The Snap Net has two lower level and two upper level drop pockets. The lower level pockets offer a window at 38" to 51" off the ground for punt snaps and a window at 15" to 28" off the ground for extra point snaps. Each drop pocket is 15" x 13." The upper level drop pockets can be used by QB's to work on making accurate throws from 3, 5 and 7-step drops. Mounted on 3" swivel wheels for ease in movement. Made entirely of aluminum. Will never rust!